Daniel Loh: A sea of Red in all pennies, why??? It is indeed a terrible terrible day in the world of pennies! A stock like Blumont priced at $1.90 can drop to $0.88 before being suspended. Asiasons drop from $2.65 to $1.04. After the trio Blumont, Asiasons and Liongold were suspended, it affected pennies like innopac and ipco, which brought down the whole penny market. Innopac and Ipco has long been rumored online that they are related to the trio. How true are they??? The trio was suspended as the company prices fall by half in one morning session! They were queried by SGX on the trading activities. But at around 4pm, Asiasons did issue a statement to clarify its activities. 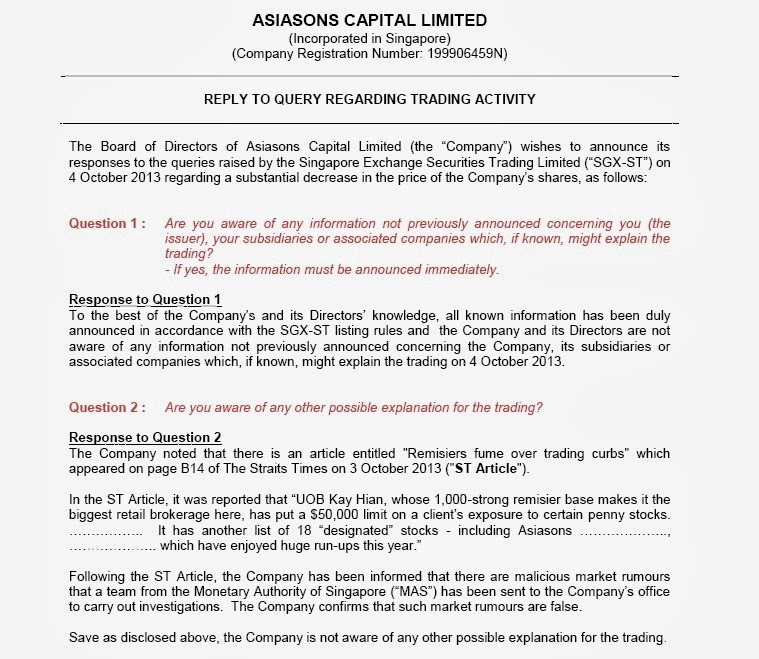 Asiasons: Brokerage Trading Limit And Malicious Market Rumours Caused Share Slump. The ironic thing is today, Blumont and Liongold both issued good news that they want to acquire businesses! Blumont: Takeover Bid For And Investment In Coal Mining Company For S$145.9 Million. LionGold: In Advanced Negotiations To Acquire Stake In Gold Mining Company. Normally Liongold and Blumont stocks climb whenever it announces some acquisitions! This is supposed to be a good news by its normal nature! I am sure the companies are also shocked by this drop today! Now I think the public would like to hear something from the company! 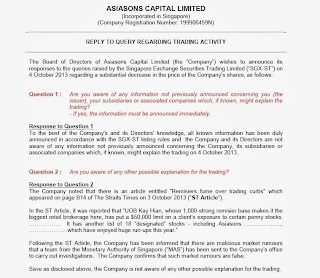 Let us see if the so-called rumors about the trading limit set on Asiasons or other companies are right. If it is wrong as said by the company, then perhaps this stock might see the mother of all bounce back. There are so many mysteries to these stocks now. Rumors and Stories are plentiful. So who is right and who is wrong? Are the companies genuinely trying to expand its business?